KRUCET 2018-2019 Notification Online Application krishna university : Krishna University has issued Post Graduate Common Entrance Test(KRUCET) 2018 Notification in March, 2018. KRUCET 2018 admission into Post Graduate Course in Krishna University Colleges. #KRUCET 2018, KRU PGCET 2018, Krishna University #PG Entrance Test 2018 Notification, Online Application Form, Eligibility Criteria, How to Apply, Last date to apply, Entrance Exam Date, Hall Tickets, Results, PG Admissions 2018 Counselling Date/ Schedule: Krishna University Machilipatnam published post graduate entrance exam notification in the month of March on it’s official website krudoa.in. Applicants who are interested in postgraduate courses can krucet apply online for this University for the session 2018-2019. For more information of kru pgcet 2018 notification, krucet online application form available on official website www.krudoa.in. 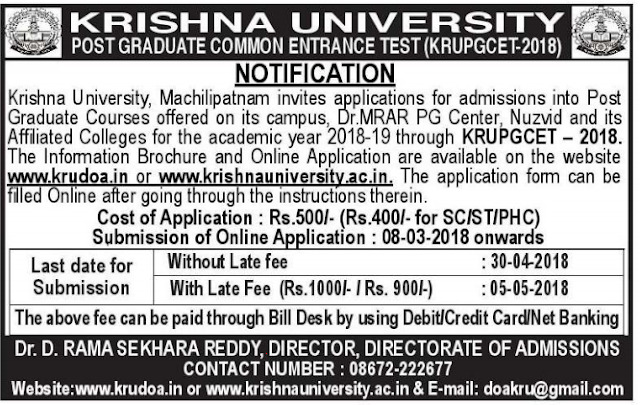 "As you are aware that Krishna University released KRUCET 2018 notification for conducting PG admission into various courses offered at Krishna University Campus College, Machilipatnam, Dr.MRARPG Center, Nuzvid along with its affiliated Colleges. In this connection, I wish to seek your support in generating the awareness among the final year degree students about to KRUCET- 2018 in the following aspects. Students should apply for KRUCET- 2018 in online application mode only. As per AP Govt. Rules fees reimbursement is issued for those students who got admitted into PG Course through KRUCET-2018 only. Krishna University Campus College is likely to be providing separate hostel facility for both boys and girl students from this academic year. Kindly provide computer lab with internet facility for students, those who wants to apply for KRUCET 2018 Notification in your college premises. Educate and motivate your final year degree students in your college for admit into their PG courses through KRUCET 2018. In view of this, kindly publicize and circulate the above mentioned aspects among your student community for their benefit." Krishna University is one of the university in Andhra Pradesh. From this university, many students are getting graduates and post graduates in many courses. It will conduct pg entrance exams to give admissions in the particular post graduate courses, and now it is releasing KRUCET 2018 entrance exam notification for the session 2018-2019. The online application form should be submitted ONLINE only at the website www.krudoa.in , www.krishnauniversity.ac.in by registering the name and other details.